Installing backup lights on your golf cart is a very simple job. 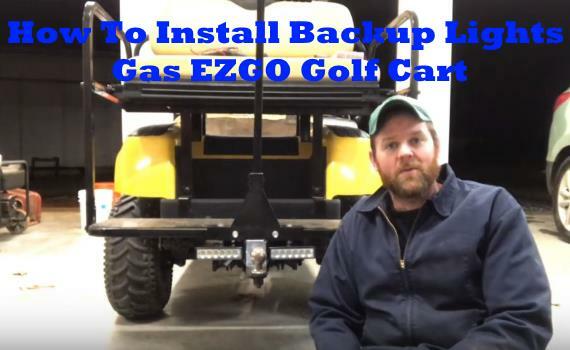 This how to video will show you how to connect the wiring to your golf cart’s brakes an works for EZ-Go or Club Car. You can use a variety of LED lights in this set-up as they don’t need to run for an extender period of time like your headlight do. While many golf carts come with basic light kits already mounted (usually, just front headlights and rear tail/brake lights), they do not come with back-up lights. That can make it difficult to use your cart around your home or off road at night. With the install of a lighting system like this there should no longer be any issue when baking up at night. Thanks to Tuber Cannonball Repair for the rear lights connection video. Basic tools and a drill if you need to add holes to to rear of the golf cart or rear seat foot board.